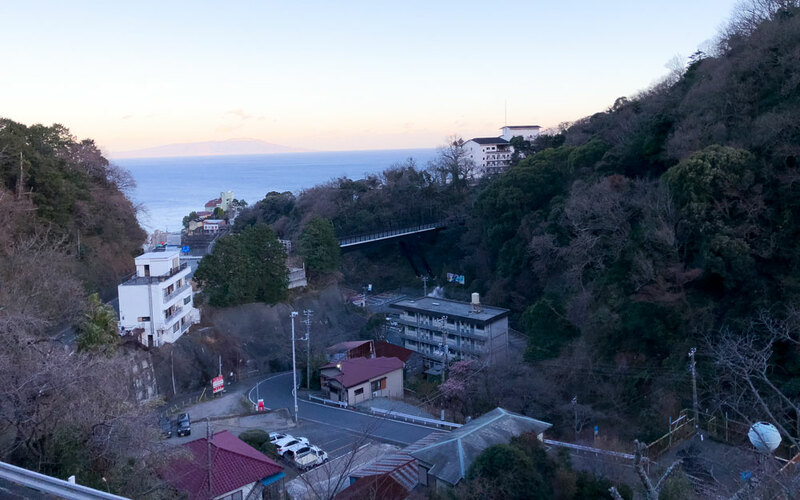 During our company retreat to Japan's Izu peninsula, we found ourselves one morning at Atagawa Station. Atagawa is a truly charming seaside town with winding hills and fantastic seafood. 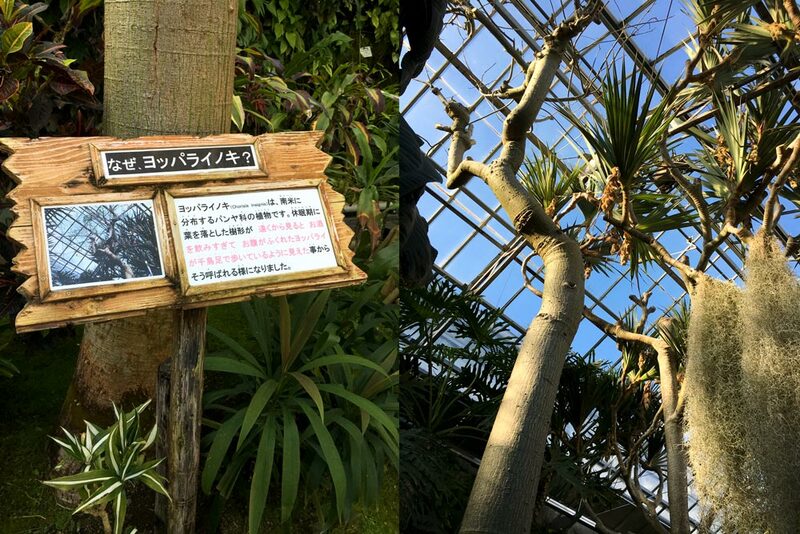 But we were there for a different purpose: to visit the Japan-famous Atagawa Tropical & Alligator Garden, known in Japanese as Atagawa Banana Wani En 熱川バナナワニ園（）. 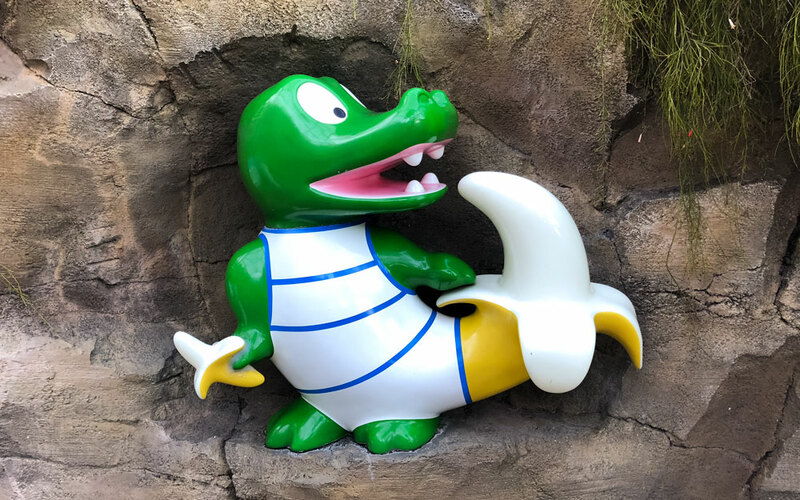 Translated, this is "Atagawa Banana Alligator Park." We make WaniKani here at Tofugu and this place has "wani" right in the name. It would be a crime if we didn't go. As soon as we turned the corner and saw that magnificent alligator mascot, our expectations of this place went through the roof. 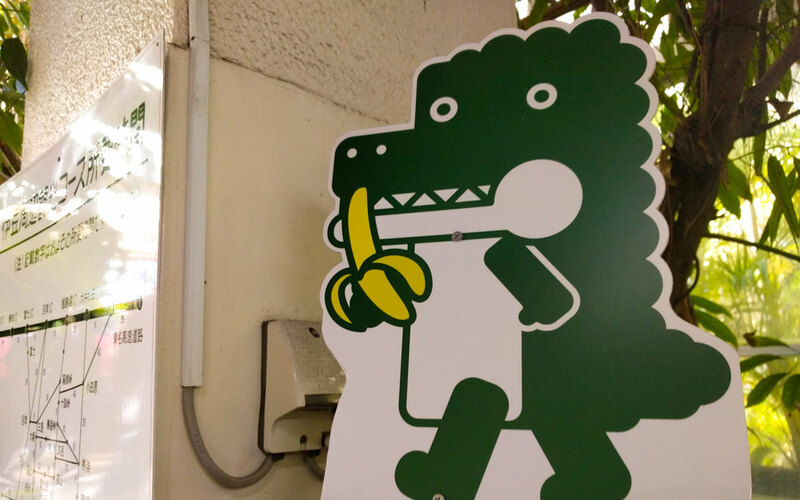 How the heck did a sleepy town in Japan get a banana alligator zoo? Today, Banana Wani has one of the largest collections of crocodiles and alligators on Earth, with twenty varieties and over 140 reptiles total. There are over 5,000 tropical plants here too. In 1955, only ten years after the end of World War II, bananas were scarce in Japan, yet people longed for them. This gave a young man named Kimura Wataru an idea: bring bananas to the Japanese people with a banana theme park. Of course, Kimura worried his business venture would not be sustainable. What if people got tired of looking at bananas? So he took the next logical step: alligators. Bananas + alligators = profit. 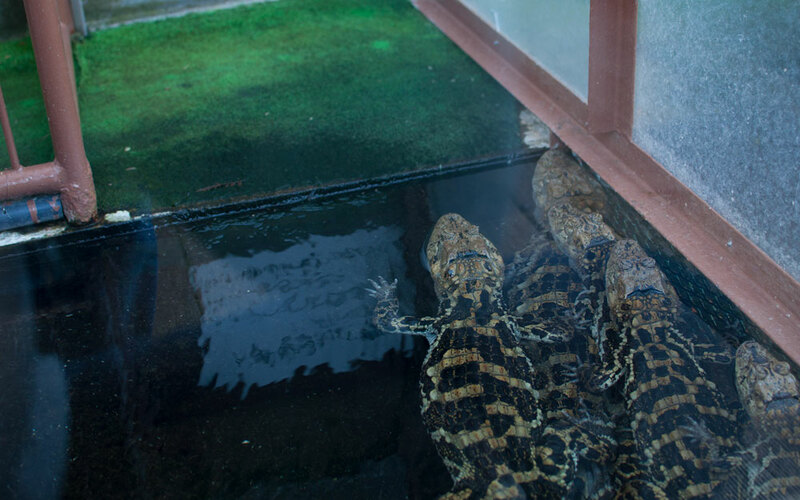 Kimura was able to buy some alligators and crocodiles through a friend and Banana Wani opened on September 20, 1958. In an interview, his granddaughter said, "It was not easy for him to get information on alligators or bananas back then. He ran into a lot of difficulty. But my grandfather didn't give up. Instead, he traveled around the world and gathered different kinds of animals, like our manatee, and a lot of plants." The red panda area opened March 1, 1971, giving patrons new, cuddly reasons to come back to Banana Wani. I'll never know why, but the name was not changed to "Banana Wani Red Panda" at this point. In 2008, the alligator zoo was renovated, adding a roof and glass enclosures, so you can more easily watch the wani wading in the water. 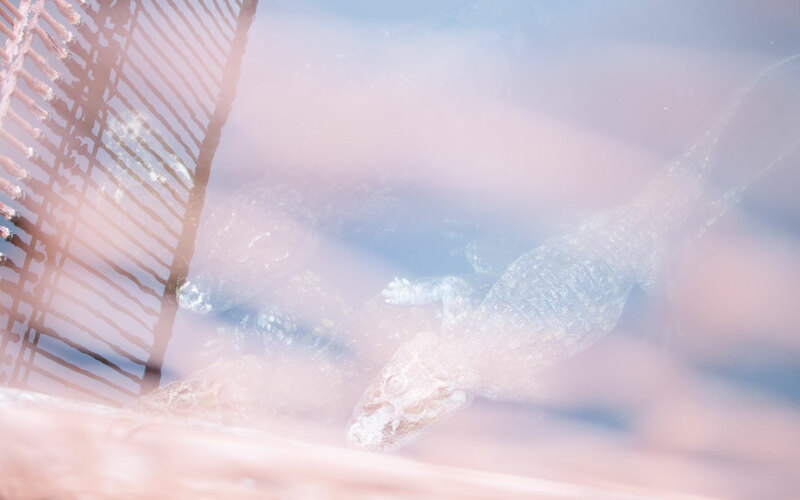 Today, Banana Wani has one of the largest collections of crocodiles and alligators on Earth, with twenty varieties and over 140 reptiles total. There are over 5,000 tropical plants here too—and let's not forget those rascally red pandas! I think the history alone makes this place worth visiting. In an age where every business venture is planned by committee and laser-focused, it's compelling to see a commercial success that started with the thought, "I dunno, bananas and alligators?" Another interesting point is that it's also remnant of Japan's postwar reconstruction. That said, what about the plants and animals inside Banana Wani? Are they interesting? Banana Wani is made up of three facilities, the first of which can be described conservatively as "plant mania." There are over 5,000 tropical plants at Banana Wani and some might say they're the highlight. For the first fifteen minutes, we were snapping plant pics like you wouldn't believe, genuinely excited about our visit (probably still running high from first seeing that amazing mascot). Then we ran into some of the animals. Let me preface this by saying Japan, in general, has different standards for what constitutes "non-upsetting animal captivity." To be fair, putting wild animals in cages is upsetting anywhere, but we were upset by some (not all) of the animal captivity we saw here. It probably wouldn't have been so bad if one of the first animals we encountered wasn't a manatee named Junto. His name means "together" in Portuguese, the language spoken in his home of Brazil. Junto is eight feet long and weighs 660 pounds. 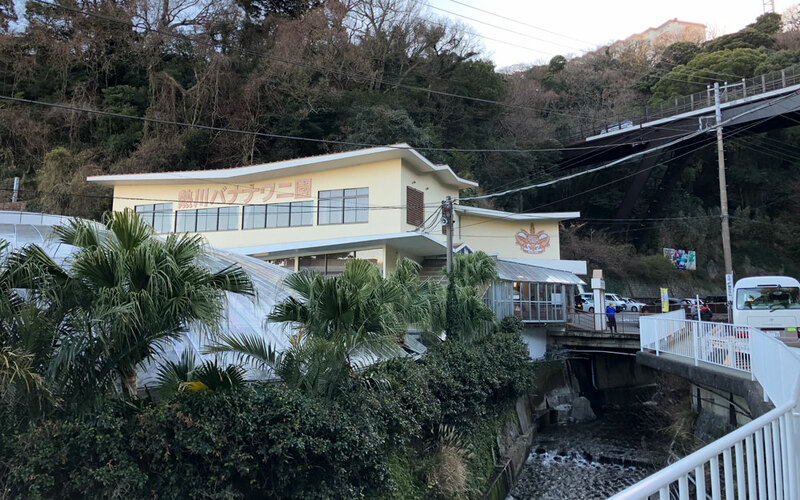 Banana Wani is absolutely the only place in Japan you can see an Amazon manatee—and that loneliness vibrates through the water and past the glass. This poor guy was in a small tank for his size, just swimming and swimming. And swimming. In circles. 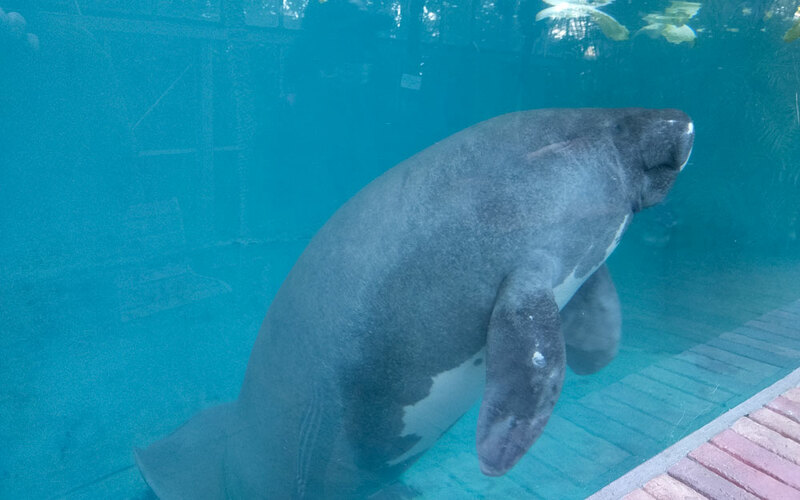 Banana Wani is absolutely the only place in Japan you can see an Amazon manatee—and that loneliness vibrates through the water and past the glass. Remember, we saw this only ten minutes after getting riled up by the Banana Wani mascot. As you can imagine, it was quite the emotional drop. What makes this sadder to me is that Junto came here in 1969, but no one bothered to name him until 2016. Some of the staff gave him names like "Manao" or "Boku-chan," but otherwise he was just "the manatee" for forty-eight years. The name Junto was chosen as part of a contest, in which of 2,111 name ideas were sent in by Banana Wani patrons. Does all this mean that Banana Wani hates Junto? Not necessarily. I think they're trying to do the best they can with what they've got. Junto arrived only eleven years after the park opened. How much money do you think a banana/alligator park had in 1969? Probably not a lot. Back then, Junto's tank was even smaller than it is now. It was rebuilt and enlarged in 2006, so we know they're at least working on giving him a better life when possible. Japanese visitors have noticed these issues and blogged about them too, so it's not like we're the only ones concerned. If you want to give Junto some love (he's apparently really friendly), you can sign up to feed him. Feedings are at 10:30 a.m. and 2:00 p.m. every day. You'll need to reserve a ticket at the entrance and only a few people get to feed him. He's a health-conscious vegetarian manatee, so get ready to throw him some cabbage! You can watch the staff wash Junto (and maybe give him hugs, I hope) every Friday at 3:00 p.m. when they drain his tank for cleaning. A manatee scrub sounds cute. I hope Junto likes being scrubbed. Anyway, Junto's situation is a tricky one to parse, but in the moment it brought us down. Post-manatee, our spirits picked up as we pressed forward through hallways of plants, but it was a dark cloud that stuck with us. Don't think about the manatee. Just focus on the plants. And what a grand assortment of plants! Big plants, little plants, frilly plants, spiky plants. Most of them were green but some had other colors too. Wow, plants! To be honest, I was indifferent to this section. I think plants are great, you know, for like the earth and stuff. And they're pretty. But I don't know enough to really appreciate the different varieties. Lucky for plant dum-dums like me, there are some signs that explain why certain plants are special or interesting. This is the baobab tree, which is sometimes called the "upside-down tree" because the top looks like roots. In Sami shamanism, it's said that the thunder god Horagalles hated the baobab growing in his garden, so he threw it down to Earth where it landed upside-down and kept growing. This is called ヨッパライノキ, or "drunk person tree," because, from a distance, it looks like a drunken man staggering down the street. We saw it up close, surrounded by other plants, so the illusion was lost on us. This one is called ビヨウタコノキ. ビヨウ means "beauty treatment" and タコ means "octopus." This tree looks like an octopus that got its hair done, so it makes sense. 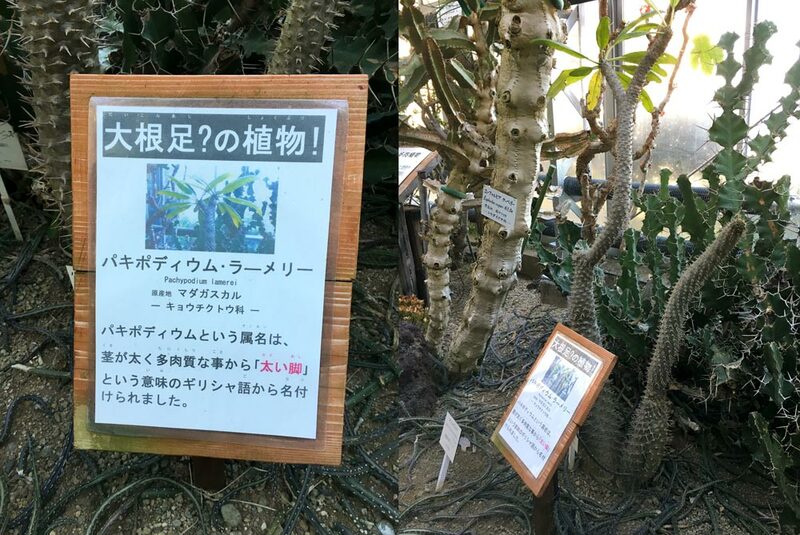 The text on this sign says 大根足?の植物! which literally means "Daikon radish leg? plants!" Japanese people use this expression to describe people with thick (and thicc) legs. 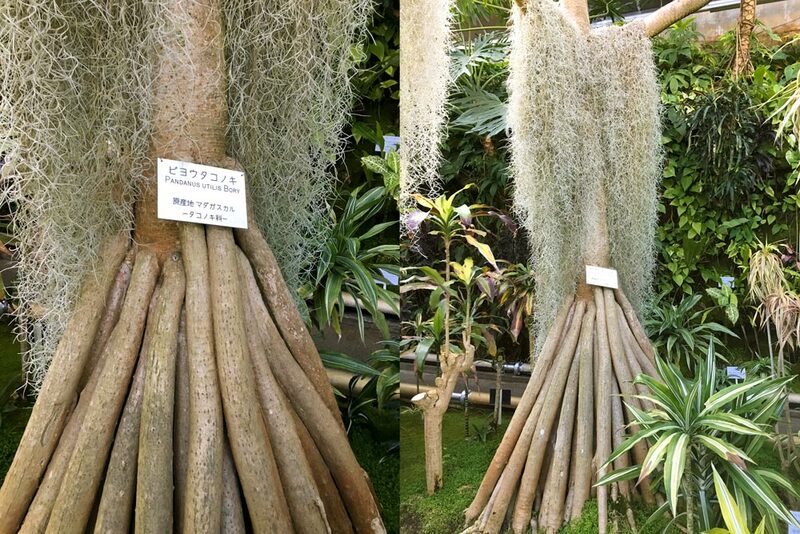 The scientific name is "Pachypodium lamerei," which is Greek for "fat legs." This dried fruit of the African devil's claw plant is called ライオンゴロシ, or "lion killer," in Japanese. It gets this name from the legend of a lion that stepped on it. He tried to pull the thorn out with his teeth but it got caught in his mouth and he starved to death. The end. Orchids are pretty fantastic, no matter which way you slice them. 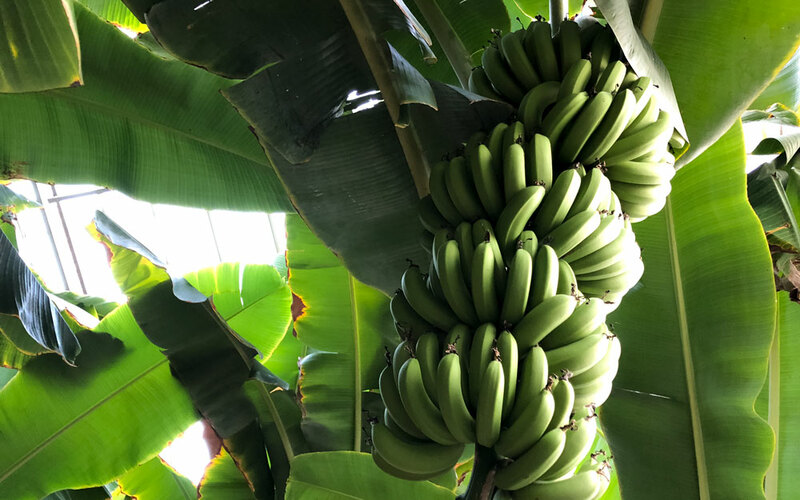 They're considered some of the most evolved plants on earth and Banana Wani has 1,500 varieties. 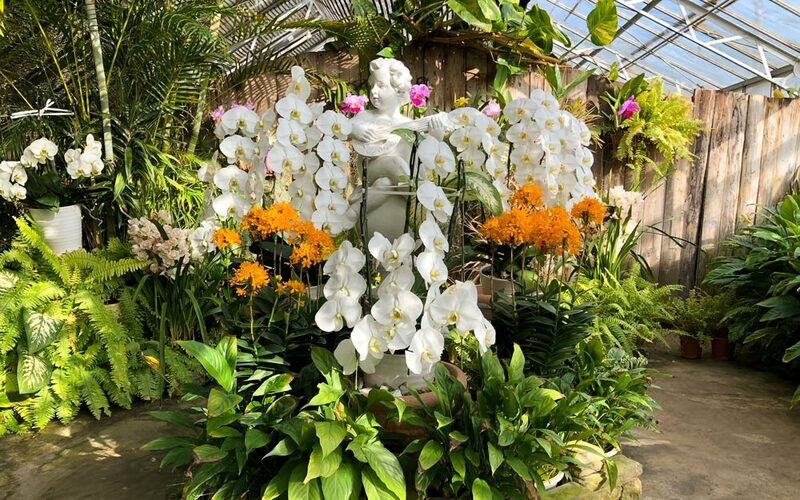 Different orchids bloom at different times of the year, so you can see new varieties each time you visit. There are 300 kinds of air plants at Banana Wani, but you'll just have to take our word on this one because we took exactly zero air plant pictures. (Sorry, there were too many plants!) If you need closure on this paragraph, print out a picture of an air plant and paste it to your computer or tablet screen at this point in the article. But there's more than just plants in the plant section. There are animals too! Uh-oh. These small gators seemed fine. 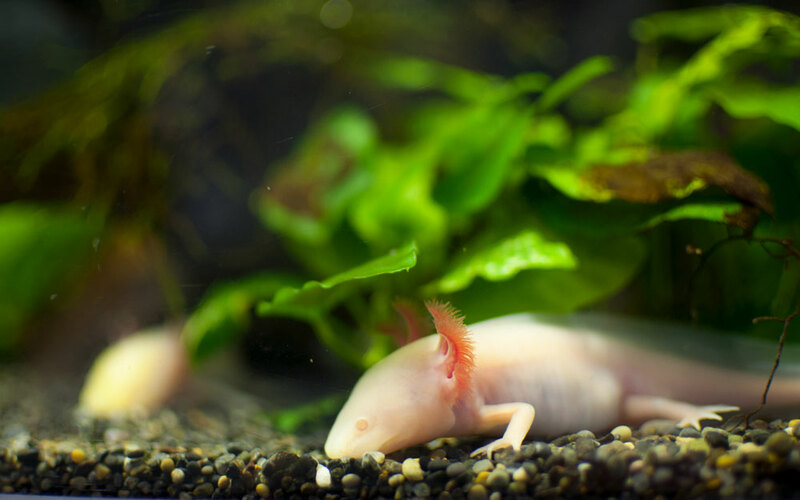 The axolotls seemed fine too, though Kristen pointed out that this species should generally be kept in darker tanks, not under a bright, hot lamp. Whoops. 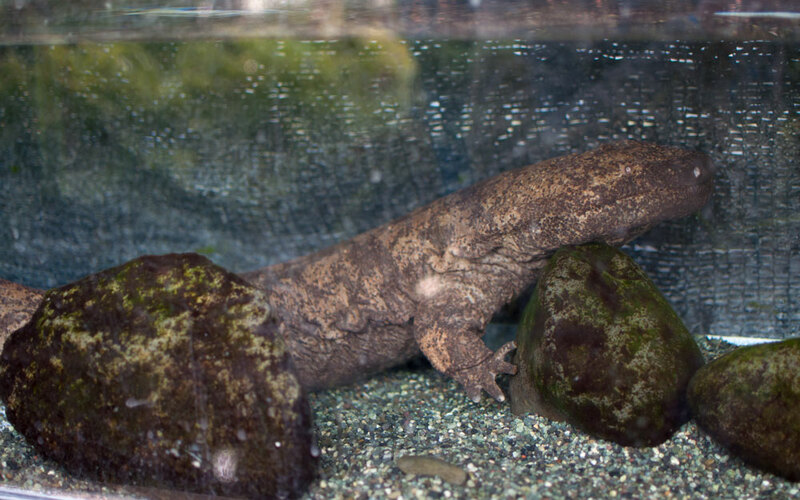 Oh no, this Chinese giant salamander definitely did not fit in his tank too well. Maybe it's okay because his brain is small? Actually, it's not okay. This species is listed as "critically endangered." Then there was the common hill myna named Kiwamu. He was in a cage too small for him and hopped endlessly, back and forth between two poles. The bottom of his cage was filled with water and filth, and his wings and tail had been clipped. He really didn't want to be in that cage and we didn't feel okay seeing him there. The dark cloud we got from Junto came back darker. It's hard to enjoy a park when you see things like this. After that, we tried to cleanse the sadness from our brains with more plants. We must have spent another hour after that walking through the facility. And we were walking quickly. This greenhouse was a little creepy because of the classical music playing over tinny loudspeakers. It felt like a section from Resident Evil, which was fine by me because I love that game. 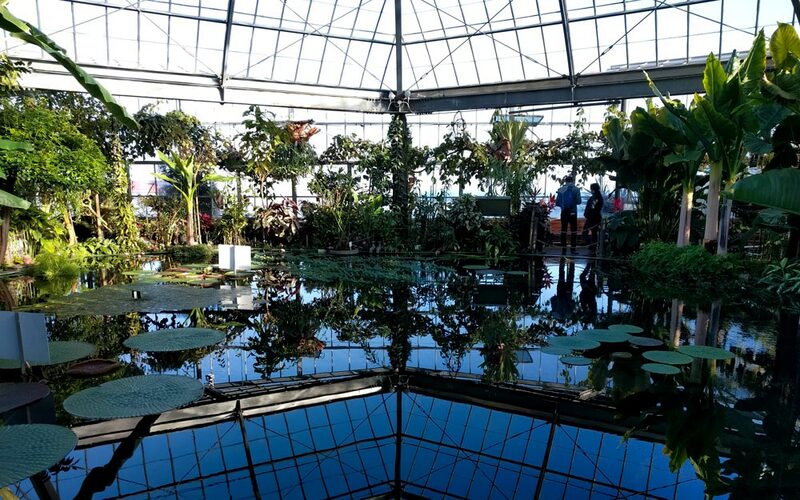 Similarly, this gigantic "lake" in the middle of another greenhouse was unexpected and quite tranquil. I stood here for a few minutes, soaking it in. We must have spent another hour after that walking through the facility. And we were walking quickly. In the lake area, there is a variety of water lily called Victoria Cruziana. With a diameter of six and a half feet, it's big enough to hold a small child. 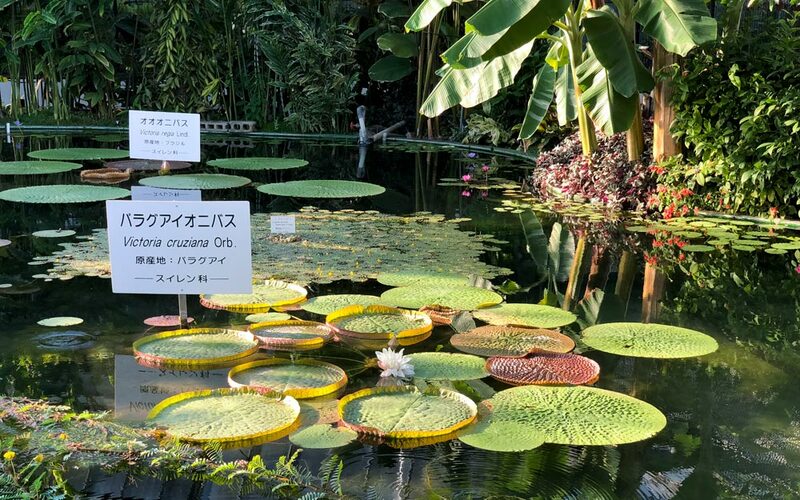 In fact, during summer vacation Banana Wani runs a promotion where you can place your kid (sixty-six pounds or lighter) on one of these water lilies and take a picture. The flowers of these lilies only bloom at night and the color and shape changes the day after it first blooms. This greenhouse was at the top of a hill in the corner of the facility and it was the last place we visited. 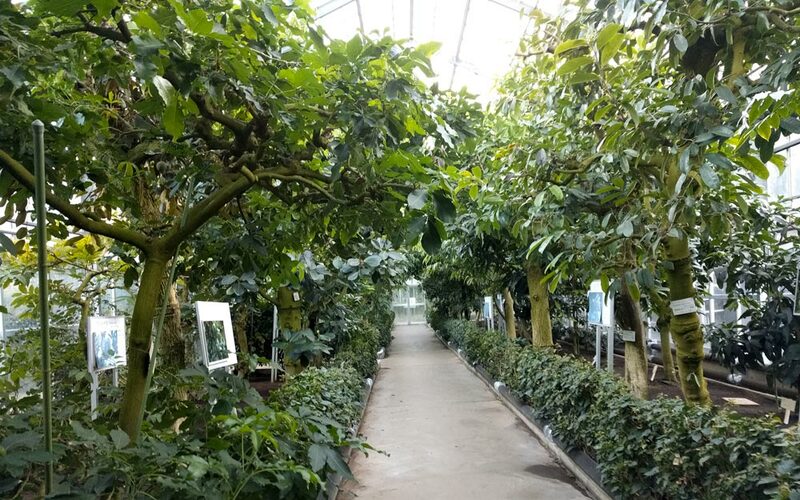 After exiting, we had to backtrack through almost every greenhouse to get back to the entrance. The next facility was exactly what we'd all been waiting for: gators and crocs! Big, toothy fellas and ladies. Chompy boys and snappy girls. Banana Wani is home to about 140 reptiles, seventeen of which are highly endangered. If you're really interested in herpetology, this is the place for you. Heck! If you want to see gator feedings or pet a baby croc, you can do both. Crocs don't eat very often, so you can only see the feedings once a week, 1:00 p.m. on Wednesdays from April to September and 1:00 p.m. on Sundays from October to March. We didn't go on the right day, so we didn't get to see any savage snapping. If you want to pet a sweet baby wani (1–2 years old), go on a Saturday between 1:00 p.m. and 2:30 p.m. or Sunday between 10:00 a.m. and 11:30 a.m. Again, we were there at the wrong time, so no croc touching for us. Gators and crocs! Big, toothy fellas and ladies. Chompy boys and snappy girls. The wani area was much smaller than the last one, but it was packed with crocodiles and alligators, not to mention a few fish and other undersea creatures. Some of the crocodile enclosures seemed plenty big, while others looked snug with a few gators piled on top of each other. I think gators like piling up though? I don't know. I'm no herpetologist. Part of me was a little thankful that the crocs were constrained. I was incredibly aware that I was surrounded on all sides by dinosaurs! If there were more room, I wonder if a croc could get a running start, leap out of its enclosure, and swallow me whole. This was an irrational fear though, because none of the crocs moved. Not once, that I saw. It was winter so they were probably extra sleepy. But you know who wasn't sleepy? This crazy guy! Whoa! A banana for a tail? And he's eating it?! But he's got a banana in his hand! Two bananas for one gator boy? What a world! There's also quite a few informational signs in this area, though you'll need to know some Japanese to fully understand what they're trying to teach you. As great as that crazy croc statue was, we had the most fun of the trip at the open tank of red garra, also known as doctor fish. These little guys are used in spa treatments all over the world, because they nibble dead skin. Banana Wani lets you dip your hands in the red garra tank and get some dead skin removed. Koichi was the first try. "It feels so weird!" he said, half laughing. We all took turns sticking our hands in, feeling the suckling, and squealing like babies. Koichi was able to keep his hand in the longest while the rest of us could only last a second or two. There were some other big fish in a tank nearby and they looked fine enough, but you can't stick any hands in those tanks. After a quick trip around the alligator arena, we exited through the gift shop. To be honest, it was fantastic. You know how no one buys anything from zoo gift shops ever? We bought quite a few things and that should tell you something. With arms full of croc memorabilia, we headed to the final facility. We didn't have much time before Banana Wani closed for the day, so we rushed back to the street where a shuttle bus was waiting for us. The final area, the red panda exhibit, was up a steep, winding cliff and after a short ride, we arrived at the entrance. It was almost closing time, so we could feel the emptiness of this exhibit. Before we entered, some Banana Wani employees gave us a couple "face hole cut-out masks," which filled us with whimsy. For even further whimsy, we popped into a small costume space, where we dressed up as bananas and a red panda. Along with the costumes, there was one gigantic nut, which we're holding in the pictures above. 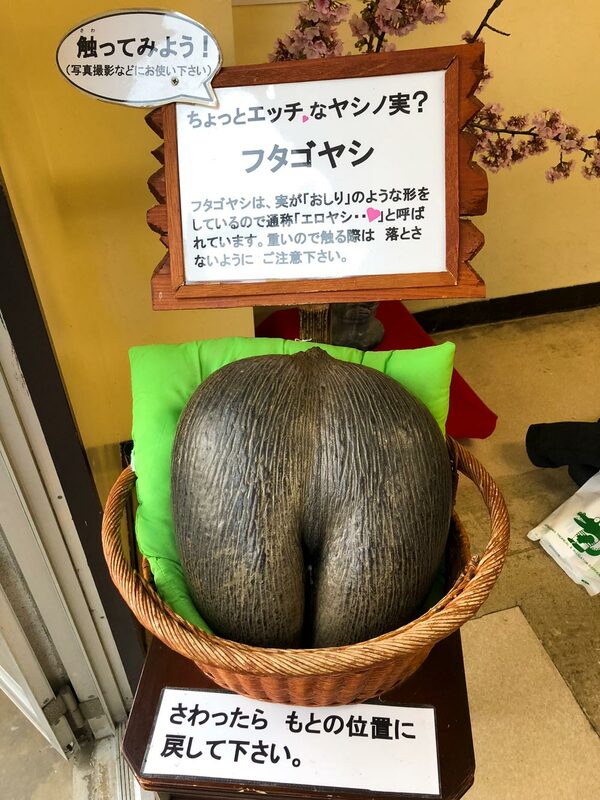 This is the nut of the Lodoicea or "sea coconut"—the largest nut of any fruit on the planet. At first, I thought it was a toy carved out of wood to go with the red panda costume. But no. That nut is real. Stepping back onto the path, we approached the red panda exhibit with some hesitation. After seeing the manatee and some of the other animals, we were afraid we'd find a red panda prison. But to our delight (and relief), the red pandas were fine. There was a large enclosure in the center of the park with trees and toys where the pandas climbed around, licked themselves, and ate fruit. They genuinely looked like they were well taken care of. All around the enclosure were cages with more red pandas nestled into cozy bundles. These cages seemed to offer plenty of room for fun times and relaxation. If Friends was recast with red pandas, these could be their apartments. All the red pandas seemed genki, as far as we could tell. The first red pandas came to Banana Wani from the Washington Zoo on November 2, 1985. Since then, Banana Wani has been breeding red pandas and trading them with overseas zoos. On July 8, 2017, Banana Wani experienced a very cute miracle: red panda triplets were born to Olivier and Cinnamon. Olivier came from the Rotterdam Zoo in Holland and Cinnamon is native Japanese citizen, born in Banana Wani. As it turns out, the red panda exhibit is one of the reasons Banana Wani is nationally famous. Getting to see fifteen red pandas up close is an opportunity most other zoos can't offer. If you want to see the red pandas go nuts, feeding time is 9:00 a.m. and 4:00 p.m. every day. They usually hold their apples all cute and run like crazy toward the zookeeper. It's not the kind of thing you want to miss. We didn't get to see the red pandas eating and ever since, we've felt our lives now lack something essential. By the way, there were some wani in this area too, but we were so over gators by this point. With only fifteen minutes left before the park closed for the day, we rushed through the rest of Banana Wani which included (finally!) bananas. 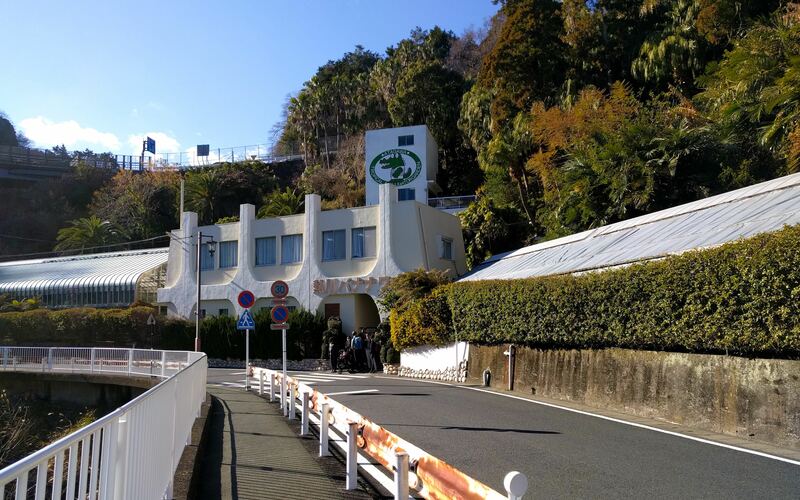 There are over twenty varieties of bananas grown here using heat from the town's onsen water. Bananas grow fast, so it takes only one and a half years until those nanners turn bright yellow, ready to pluck. Bananas aren't they only fruits grown at Banana Wani though. They've got papayas, mangoes, coffee, and more! We rushed through this part real fast because that closing time was nipping at our heels like a croc hungry for ankle meat. We ran into some some flamingos and tortoises, which both seemed fine as far as we could tell. On the way out, there's a little cafe, which is the only place where you can eat the bananas grown at Banana Wani. These are titular bananas, people! 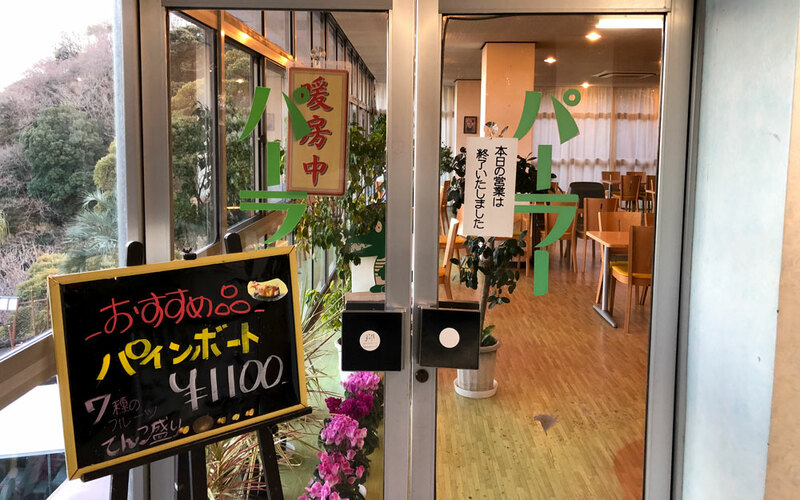 Unfortunately, it was closed by the time we got there, so we'll never know the taste of nanners grown with onsen water. And finally, a spectacular view! Being on top of a building on top of a cliff has its advantages. And I thought this town was gorgeous at street level! 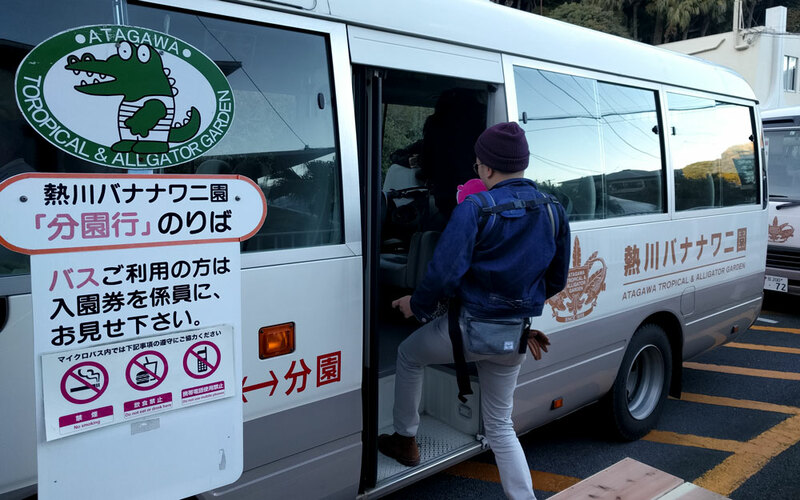 When we got back to the entrance where the bus was waiting for us, we piled in and headed back to the station, waving goodbye to that wonderful wani mascot. Overall, Banana Wani was a "fine" experience. If I had to do it over again, I would start with the red panda exhibit and work my way backward to the plants. The red pandas and many other animals were fine, so it would've been better than running into the world's loneliest manatee right off the bat. I should mention, our visit was in the middle of winter so there was maybe one other family in all of Banana Wani that I remember. It was very empty and the outdoor plants were brown, which, in addition to Junto the manatee exile, probably made Banana Wani feel sadder than it actually is. Banana Wani is an interesting holdover from Japan's postwar reconstruction and bubble economy. It opened in 1958 and was (maybe still is) a major attraction. Later in my trip, I told my friend in Kansai that I was in Izu and she immediately said, "Oh! Did you go to Banana Wani?" 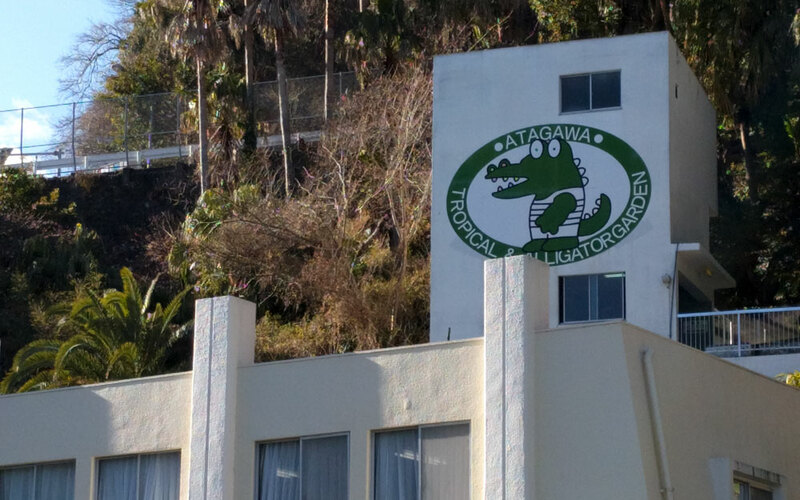 This gave me the impression that Atagawa's croc-o-plant park might be a bigger deal than I had thought previously. If I'm ever in Izu again in summer, I might give Banana Wani another shot. Knowing what I know now, I think it would be a different experience. If you're at all interested in reptiles, plants, and/or red pandas, it's definitely worth the trip. If you're a botanist and a herpetologist, you'll have an absolute blast. Just don't stand there staring at the manatee for twenty minutes like we did. As much as I try to be objective about this place, Banana Wani gets a thumbs down from me. The animal captivity stuff bummed me out, sure—but it was just too many plants and crocs, neither of which I’m particularly interested in. Going with friends was fun because friends are fun. If I was by myself, I would’ve left after the first hour. I like the name. I like the mascot. I like the greenhouse. What made me sad are the living conditions of the animals, especially the manatee. Based on this very fact, it is hard for me to recommend this place. I didn’t like the conditions the animals were kept in at Banana Wani, though that’s pretty par for the course when it comes to Japanese zoos and zoo-like places. At least the bananas looked happy… that is, until the blight comes for them. You see, the Cavendish banana is in peril, and there’s not much we can do about it. Commercial banana plants all originate from clones of the same banana plant, which was a tree kept on the Cavendish family’s property. Because they all share the same genetic makeup, when a killer blight appears, it will kill them all. They all have the same weakness to it. This already happened in the 1950s when the Gros Michel banana plant was wiped out by disease. You know how Runts candy bananas don’t taste like bananas? Actually they do, their taste profile comes from the Gros Michel bananas. Anyway, now the blight is back, and we’re going to lose the Cavendish. Eat it while you can, because they’re deciding on the new banana we’ll all have to eat. Unfortunately, it will probably be chosen for its resistance to various funguses, which means taste isn’t their highest priority. If it were me, I’d try to push for more variety, though that would greatly increase prices. I for one would be willing to pay more for better, tastier bananas. Please write a letter to your congressperson. I’ve been conflicted about Banana Wani since we left. I loved the plants, the ponds, even the eerie silent nature of the complex in winter. I found reading about the names of Japanese plants, comparing them to ours, and adventuring through the humid, heated rooms, back out into the icy cold, and back in again strangely satisfying. 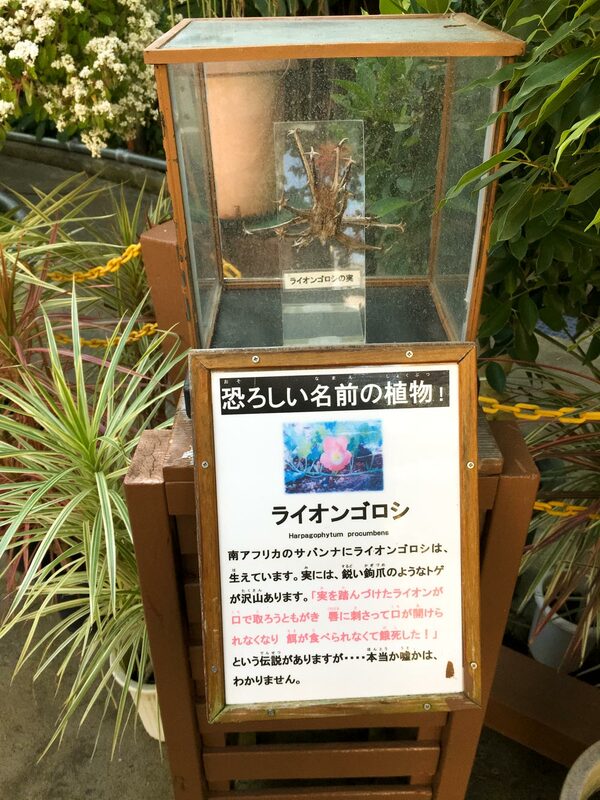 I found the same species of nerve plant I have on my desk back at the Tofugu office! And then there were the animals. I’ve never been a huge fan of seeing animals in captivity in Japan or many other places, for that matter. But if you’re already in Atagawa, I think it’s worth the trip just for the plant life and the gorgeous views of the ocean. But if you do, please mention that Junto needs a bigger tank to the people there and maybe they’ll get the hint. The flowers and ponds were beautiful, vibrant, and obviously well taken care of. The animals, however, were not. I enjoyed walking around Banana Wani, but every other turn I was confronted by an animal in a cage or tank that was way too small. For that reason I wouldn’t visit again, but it really is a nice and quiet walk with inspiring scenery and probably a decent place to write. The flora was fantastic, with surprising amounts of variety and lovingly-maintained grounds. 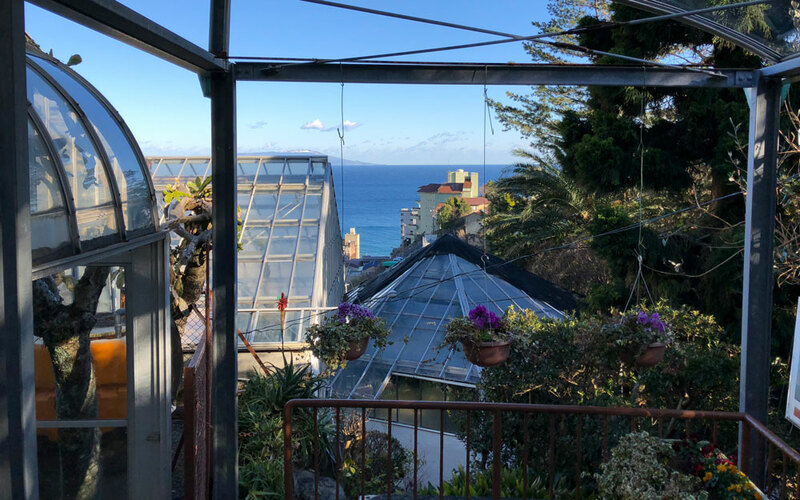 The sweeping views from all of the greenhouses and atriums only got better as the buildings wound up the hill. Visiting in the spring or fall, with all the corresponding colors, would be a sight! Sadly, the beauty of the place was marred every time I saw an animal. The entire alligator area made me feel like I was personally abusing the poor creatures, stuck in ponds that were barely bigger than they were. 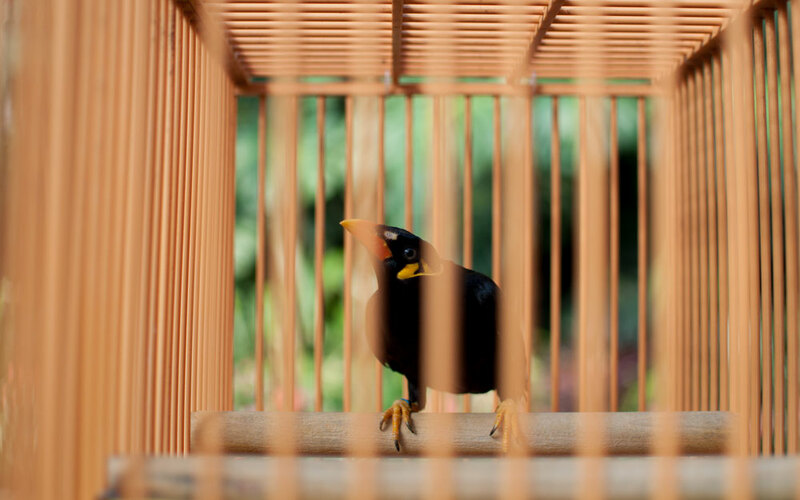 Birds were confined to cages so small it looked like they couldn’t spread their wings, much less fly. Then there was the manatee, swimming in sad little circles at the bottom of its tiny, dirty pool. So I vote “no more visits for me.” Maybe they can turn around their animal treatment or just ditch them in general and focus on the beautiful gardens. Until then, I won’t be back. This place is huge. I didn’t expect I’d walk this much. I liked some parts of Banana Wani such as the wide variety of plants, cute and unique souvenirs, and of course the unique combination of wani and banana they came up with. Also, I’d probably enjoy their cafe, if it was open. Banana Wani was an interesting trip for me. I’ve never been to a banana crocodile zoo in my life (okay, I’m sure none of us had), so it was fun seeing the wani area and so many kinds of bananas in one place. 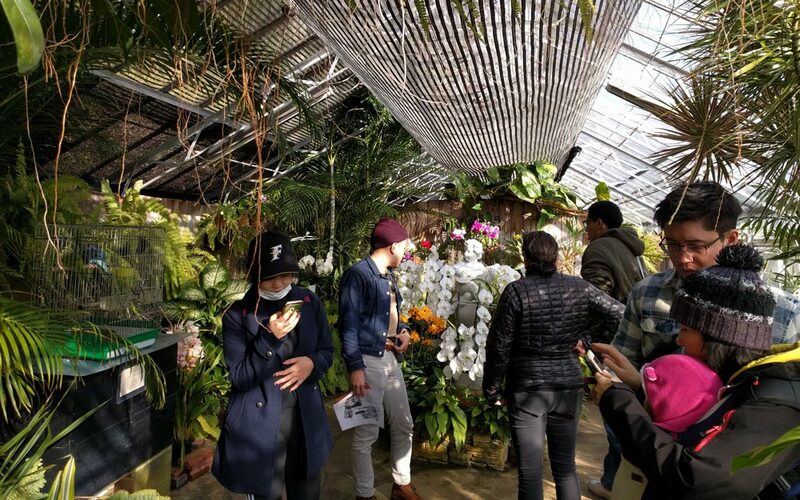 I was also impressed by the variety of plants they had in the greenhouses, from the tropical plants to the beautiful orchids—they really did an amazing job taking care of them! Seeing Junto the manatee and some of the animals’ situation made me sad, but hopefully when I visit Banana Wani again if I’m ever in Izu, that would change.